American River Striping has more than two decades of experience in the repair and maintenance of asphalt. We deal with a wide variety of customers that include large corporations, retail chains, property management companies, small businesses, and residential areas. Our high quality work and customer service has helped us maintain long term relationships with some of the nation’s largest brands. As well maintained asphalt reaches the end of its life cycle there is an increased need for regular asphalt repairs. Even after many years of proper maintenance, cracks and other natural defects become too large to manage. When left unattended these defects lead to alligatoring and potholes, and must be addressed. It’s also the case that property owners often inherit pavement that has never been maintained. When this occurs asphalt repairs are the first step in putting a parking lot back on track and maximizing its life potential. Our team of asphalt experts are experienced in identifying all forms of asphalt defects and offering the best solution for the problem. We perform full depth asphalt patches on areas where the asphalt base needs replacing and skin patches where the defect is only on the surface. 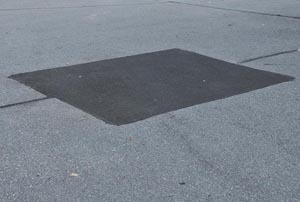 We carry effective hot and cold patch materials and fill potholes in a variety of weather and traffic conditions. Contact American River Striping at 866-592-3356 or fill out the form on the right for a free, no obligation consultation for our Asphalt Repair services.